Download Offline Setup Installer Google Chrome 26. The Chrome team over Google has announced on March 26 the availability of the new Chrome 26 stable (v26.0.1410.43) browser for Windows, Mac, Linux and Chrome Frame. Yet another stable version of Chrome browser! 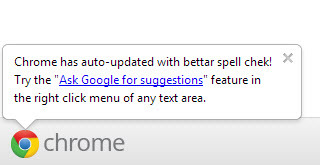 Chrome 26 Stable doesn’t come with a bunch of new features, in fact there is only one new feature landed to the browser. The browser now gets “Ask Google for suggestions” cloud spell checking feature. The feature is powered by the same technologies used by Google search, now supports grammar checking, proper nouns, homonyms, and context-sensitive spell checking in English. To enable this feature, right-click inside the text field that you’re typing in and select Spell-checker options > Ask Google for suggestions. Besides that, the browser’s built-in spell checker get refreshed dictionaries for all languages, plus added language support for Korean, Tamil and Albanian. In addition, users who add custom words to the dictionary can now sync their settings to bring those changes to all the devices where they run Google Chrome. Other improvements include desktop shortcuts for multiple users (profiles) on Windows and asynchronous DNS resolver on Mac and Linux. Google Chrome 26 Stable is compatible with Windows 8, Windows 7, Vista and XP, Mac and Linux operating systems. For Mac users, you can download the offline setup installer for Google Chrome 26 Stable from this link. Meanwhile, Linux users can get Google Chrome 26 here.